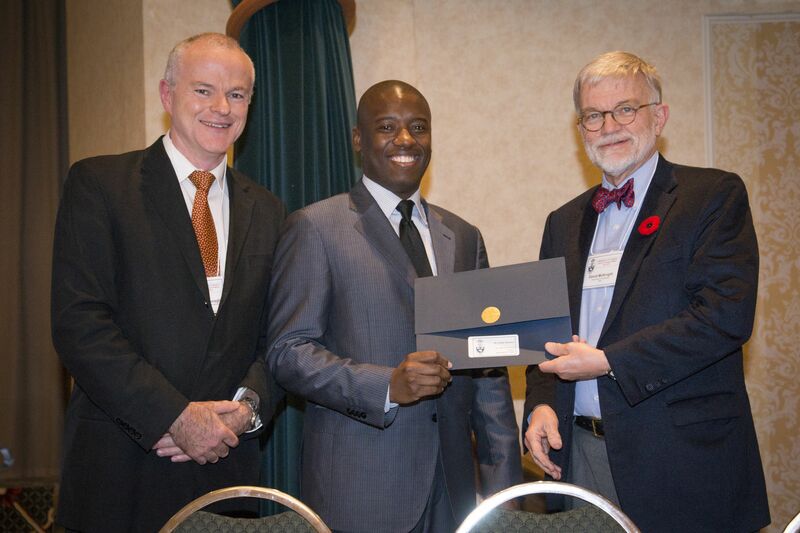 Clyde Matava - Dr. John Desmond Teaching Award 2015 Education is a top priority in the Department of Anesthesia. Each year, the department recognizes excellence in undergraduate education with the Dr. John Desmond Award. Nominations for the award come from medical students and faculty members who wish to acknowledge outstanding clinical instruction of undergraduate students. Nominees typically demonstrate their devotion to education through clinical teaching, lectures and tutoring in addition to their contributions to teaching innovations and educational research. This year, the Department of Anesthesia was pleased to present the Dr. John Desmond Award to Dr. Clyde Matava. Originally from Harare, Zimbabwe, Dr. Matava has been with The Hospital for Sick Children here in Toronto since 2008. After completing his fellowship in pediatric anesthesia in 2009, Dr. Matava quickly became involved in education as a staff member. His dedication to both patients and students has since become a hallmark of Dr. Matava's work at SickKids. His teaching efforts have already been recognized with numerous other teaching awards, including the Robert Creighton Award for Excellence in Residence Teaching (2010 and 2012) as well as the 2013 Department of Anesthesia New Faculty Teaching Excellence Award. Dr. Matava's research interests in medical education revolve primarily around the technological innovation of apps and software for use by patients, clinicians and students. He is the creator of the PediPain App, a weight/age based analgesic dose calculator that guides health-care practitioners in the pain management of perioperative pain in paediatric patients. He is also actively involved in organizing the annual conference for the Canadian Pediatric Anesthesia Society, which specializes in educational needs for pediatric anesthesiologists from across Canada. Although Dr. Matava's work has served students at all levels of their medical educations, he has demonstrated a special interest in undergraduate education through his contributions as a member of the Undergraduate Education Committee. Additionally, he has contributed to the development of eModules used by anesthesia clerks at the University of Toronto as part of the "flipped classroom" model, a pedagogical approach that is learner-centred and offers instructional content in a variety of forms to maximize student engagement with material. Dr. Mark Crawford, Chief of the Department of Anesthesia and Pain Medicine at The Hospital for Sick Children, identifies Dr. Matava as "an inspiration to us all with respect to his ability to maintain a consistently high level of excellence in education, particularly at the undergraduate level." It is with this endorsement along with his continued dedication to teaching that the Department of Anesthesia is pleased to present Dr. Clyde Matava with the 2015 Dr. John Desmond Award for excellence in undergraduate teaching.